If your kid loves Batman and riding its bike then you should protect them with this Batman Logo Bicycle Helmet. The bicycle helmet is yellow and black and on the yellow part you can find the famous bat symbol we all know from the Batman stories. You can adjust the helmet to fit kids ages 3 – 8 and to make it safe in the dark too they added a light to the back of the helmet so that people behind your child can still see them in the dark. A Batman helmet like this is great for many activities like riding scooters, bicycles, rollerblades, and skateboards. How about a PAW Patrol toddler helmet to protect your child’s head while playing outside? This helmet is blue and yellow and adjustable in size to fit many toddlers heads and that makes it perfect for kids that like to bike, skate or do what ever else they want that needs a helmet. 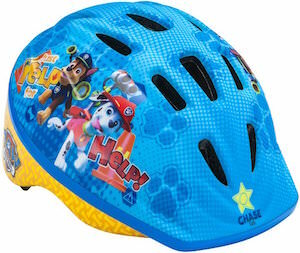 On the helmet you can find the PAW Patrol logo but also Chase and Marshall and the text “Yelp for Help!”. Kids are going to love this PAW Patrol helmet and that of course is perfect as it will make it easier to convince them to wear the helmet. 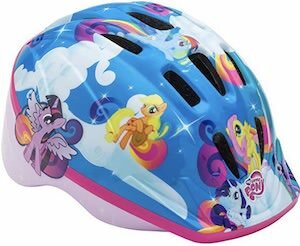 Do you have a kid that like Hello Kitty and needs a helmet for biking or skating? 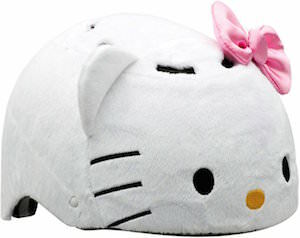 How about this white Hello Kitty helmet that is covered in a plush cover and has the face of Hello Kitty on it and even ears and a pink bow. This helmet is bike and ASTM-1492 skate compliant and size 51 – 54 CM. A helmet like this is so cute that kids may even wear it inside and doing all kind of stuff because now they can look like Hello Kitty by wearing a safety helmet. So lets go play outside and when a helmet is needed then go wear this Hello Kitty Bike Helmet. Iron Man is one of the coolest superhero’s out there and if you kid thinks so to then this could be the perfect helmet for them. This bicycle helmet looks a lot like the mask of Iron Man and that makes it perfect for kids that just adore this Avenger. 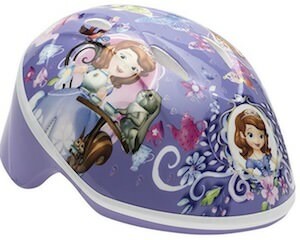 The bike helmet is made for kids age 5 and up and has a size of 50 – 54 cm. And this Marvel Iron Man helmet is TSM/CPSC Safety Certified so that you know the helmet real will do the job. Besides biking kids are gone love running around with it all the time but it is useful to for tasks like skateboarding or roller balding. 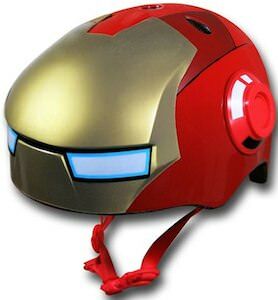 Make you kid happy with this special Marvel Iron Man Kids Bicycle Helmet. Does you kid love to bike around all day long but just hates to wear a helmet? Maybe it helps if the bicycle helmet was more fun. Now there is a blue helmet with the marking of Captain America on it and yes that includes the famous shield witch can be found on the front of the helmet. 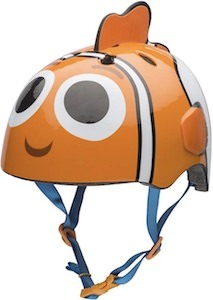 This kids helmet is made for kids 5 years and up and (helmet size 50 – 54 cm) and is ATSM/CPSC Safety certified. 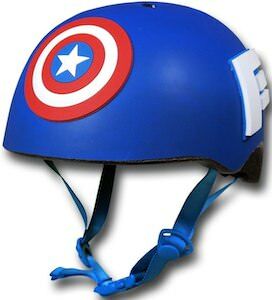 Of course kids can wear this Captain America helmet for other adventures to from skateboarding to just dress up games this helmet is made for the task. Make you kid happy with this cool Captain America Bicycle Helmet. All parents should always make sure there child’s head is protected when the go outside riding their bicycle. Do your kids love the Teenage Mutant Ninja Turtles? 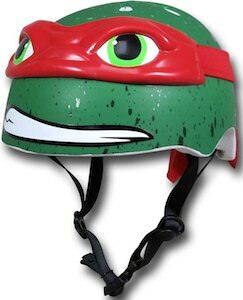 If there favorite TMNT character is Raphael they would love to wear this cool Raphael helmet on their head while having fun on their bike. This awesome TMNT Raphael helmet is in the shape and color of Raphael’s head wearing is red bandana tied in the back hanging down and his teeth are showing. In the back corner of the helmet, there is a picture of Raphael with a Sai his weapon of choice ready to fight off his enemy’s. The cool kids Teenage Mutant Ninja Turtle Raphael helmet is ATSM/CPSC certified and measures 50-54 cm in size. 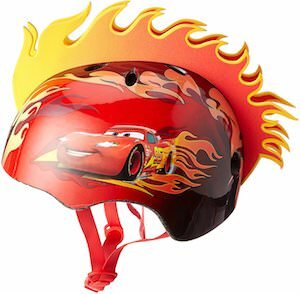 Also, this helmet would be great to use when Roller blading, or when they are learning to skate or even skate boarding.